Obama helped fund 'Alinsky Academy': "The Woods Fund, a nonprofit on which Obama served as paid director from 1999 to December 2002, provided startup funding and later capital to the Midwest Academy.... Obama sat on the Woods Fund board alongside William Ayers, founder of the Weather Underground domestic terrorist organization.... 'Midwest describes itself as 'one of the nation's oldest and best-known schools for community organizations, citizen organizations and individuals committed to progressive social change.'... Midwest teaches Alinsky tactics of community organizing." 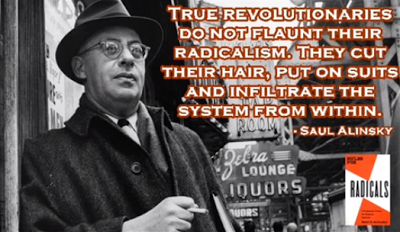 Hillary, Obama and the Cult of Alinsky: "True revolutionaries do not flaunt their radicalism, Alinsky taught. They cut their hair, put on suits and infiltrate the system from within. Alinsky viewed revolution as a slow, patient process. The trick was to penetrate existing institutions such as churches, unions and political parties.... Many leftists view Hillary as a sell-out because she claims to hold moderate views on some issues. However, Hillary is simply following Alinsky’s counsel to do and say whatever it takes to gain power. "The Revolutionary force today has two targets, moral as well as material. Its young protagonists are one moment reminiscent of the idealistic early Christians, yet they also urge violence and cry, 'Burn the system down!' They have no illusions about the system, but plenty of illusions about the way to change our world. It is to this point that I have written this book." Alinsky's tactics were based, not on Stalin's revolutionary violence, but on the Neo-Marxist strategies of Antonio Gramsci, an Italian Communist. Relying on gradualism, infiltration and the dialectic process rather than a bloody revolution, Gramsci's transformational Marxism was so subtle that few even noticed the deliberate changes. "By 1985, the influence of traditional Christian philosophy in the West was weak and negligible.... Gramsci's master strategy was now feasible. Humanly speaking, it was no longer too tall an order to strip large majorities of men and women in the West of those last vestiges that remained to them of Christianity's transcendent God." "She said, 'Barack stood up that day,' talking about a visit to Chicago neighborhoods, 'and spoke words that have stayed with me ever since. He talked about 'The world as it is' and 'The world as it should be…' And, 'All of us driven by a simple belief that the world as it is just won't do – that we have an obligation to, fight for the world as it should be." Do you wonder who -- or whose values -- should determine what "the world... should be?" "Conversely, if you have a good relationship, he is very receptive.... For example, I have always believed that birth control and abortion are personal rights to be exercised by the individual. If, in my early days when I organized... neighborhood in Chicago, which was 95 per cent Roman Catholic, I had tried to communicate this, even through the experience of the residents, whose economic plight was aggravated by large families, that would have been the end of my relationship with the community. That instant I would have been stamped as an enemy of the church and all communication would have ceased. "From the moment the organizer enters a community he lives, dreams... only one thing and that is to build the mass power base of what he calls the army. Until he has developed that mass power base, he confronts no major issues.... Until he has those means and power instruments, his 'tactics' are very different from power tactics. Therefore, every move revolves around one central point: how many recruits will this bring into the organization, whether by means of local organizations, churches, service groups, labor Unions, corner gangs, or as individuals." FREEZING group life on the new level." 1. "Power is not only what you have, but what the enemy thinks you have." 2. "Never go outside the expertise of your people. When an action or tactic is outside the experience of the people, the result is confusion, fear and retreat.... [and] the collapse of communication. 4. "Make the enemy live up to its own book of rules. You can kill them with this, for they can no more obey their own rules than the Christian church can live up to Christianity." 5. "Ridicule is man's most potent weapon. It is almost impossible to counteract ridicule. Also it infuriates the opposition, which then reacts to your advantage." 6. "A good tactic is one your people enjoy." 7. "A tactic that drags on too long becomes a drag. Man can sustain militant interest in any issue for only a limited time...."
8. "Keep the pressure on, with different tactics and actions, and utilize all events of the period for your purpose." 9. "The threat is usually more terrifying than the thing itself." 10. "The major premise for tactics is the development of operations that will maintain a constant pressure upon the opposition. It is this unceasing pressure that results in the reactions from the opposition that are essential for the success of the campaign." 11. "If you push a negative hard and deep enough, it will break through into its counterside... every positive has its negative." 12. "The price of a successful attack is a constructive alternative." Saul Alinksky, Rules for Radicals, Vintage Books, New York, 1989. Alinsky's Rules for Radicals: "Known as the 'father of modern American radicalism,' Saul D. Alinsky (1909-1972) developed strategies and tactics that take the enormous, unfocused emotional energy of grassroots groups and transform it into effective anti-government and anti-corporate activism. ... Some of these rules are ruthless, but they work." "'The organizer's first job is to create the issues or problems,' and 'organizations must be based on many issues.' The organizer 'must first rub raw the resentments of the people of the community; fan the latent hostilities of many of the people to the point of overt expression. He must search out controversy and issues, rather than avoid them, for unless there is controversy people are not concerned enough to act. . . . An organizer must stir up dissatisfaction and discontent.'"